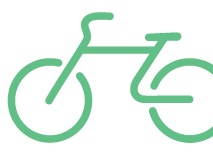 Recently, we can see many people riding white and green bicycles, dashing through the streets of Seoul. 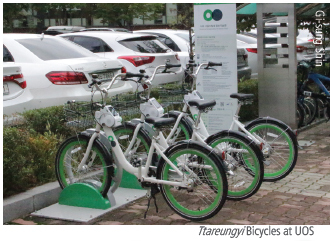 Those bicycles belong to an unmanned bicycle renting system named Seoul Bike, or Ttareungyi. Ttareungyi is an unmanned bicycle renting system operated by the Metropolitan Government of Seoul. It was launched in October of last year. The main objectives of this program are to improve citizens’ health, decrease air pollution, and resolve traffic congestion. Although its history is relatively short, many people have already started to use Ttareungyi. Since its launch, the number of users has increased to about 100,000, and the number of Ttareungyi bicycles has increased to about 5,600. “I started to use Ttareungyi since there are some rental stations near the school and many other people have started to use it,” Eun-chong Noh (School of Electrical and Computer Engineering, ’16) said. 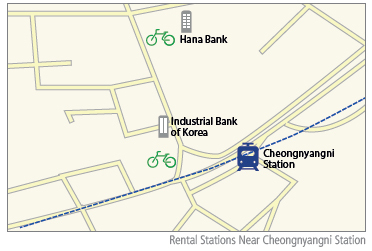 There are about 400 Ttareungyi rental stations in Seoul, usually located in places where there is a lot of foot traffic. At the rental stations, you can rent a bicycle by using a card, which must be preregistered, or by using a smartphone app. You should return the rented Ttareungyi bicycle within an hour, unless you are willing to pay additional charges. This policy still applies even if you have already purchased a seasonal voucher. All users are allowed to rent Ttareungyi bicycles in one hour intervals, with a maximum of four hours per day. This is to give every citizen an equal chance to use the system. When you return the bicycle, you can drop it off at any rental station. You do not have to apply for membership to use Ttareungyi but without membership you cannot purchase the seasonal voucher. People without Ttareungyi membership are only allowed to buy one-day vouchers. For those with seasonal membership, there are 7-day vouchers, 30-day vouchers, 180-day vouchers, 365-day vouchers. Considering the fact that Ttareungyi only began last year, we will have to wait a while before evaluating its outcomes. However, it is true that many people had already started to use the Ttareungyi system and there is a possibility that it could benefit people’s lives in many ways. It is also important to remember that the Ttareungyi system was undertaken as an attempt to make Seoul a better place to live. It is therefore important for all who wish to use Ttareungyi to treat it properly. If you are planning to use Ttareungyi, please cooperate in improving the quality of life in Seoul. 01 Access the website or smartphone app (In this picture, the smartphone version is shown). A-2. (For registered members) Log in. A-3. Select the kind of voucher you wish to buy (In this case, it is the one-day voucher). A-4. Pay for the voucher. The picture shows the cell phone payment method. It is possible to pay via credit card. B-2. (For people who are not members) Select the one-day voucher for nonmembers. B-3. Agree to all the terms. Then pay for the voucher. You will have to confirm that you are the one paying. The picture shows the cell phone payment system, although nonmembers can also pay by credit card. B-4. Log in. Your ID is your cell phone number and your password will be the first set of numbers sent through text message (see the picture on the left for an example). The next four numbers (the second set of numbers sent through text message) will be the bicycle’s rental code. 02 Select a rental method. The highlighted box means “select rental station,” which we will be used in this example. 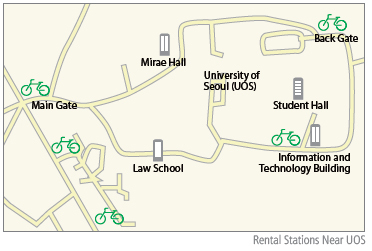 As an alternative, you can also rent bicycles using QR codes, which is what the other box indicates. 03 Select a rental station and bicycle. 04 Turn on the terminal of the bicycle and enter the rental code (the second set of four numbers sent by text message). In addition, you can use a traffic card if you have one preregistered. 05 When returning the bicycle, connect the lock to the right part of the terminal.